For more information and to sign-up for your desired table talk, please click here. Floods - Fires - Hurricanes - Tornadoes We're there. 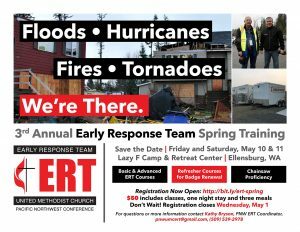 Early Response Team members are trained and badged volunteers ready to clean out flooded homes, sift ashes, haul debris after local, regional and national disasters. Teams work alongside and provide a caring Christian presence for disaster survivors. This two-day training offers Basic training for first-time participants and Advanced classes for current and renewing badge holders. For more information please contact Kathy Bryson at pnwumcert@gmail.com. CLICK HERE to Register Today! 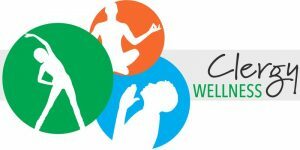 The dates for the 2019 PNW Annual Conference Session are Friday, June 7 through Sunday, June 9th, 2019. As in previous years, pre-conference meetings for some participants are likely to occur on Thursday, June 6th. Click here for more information.